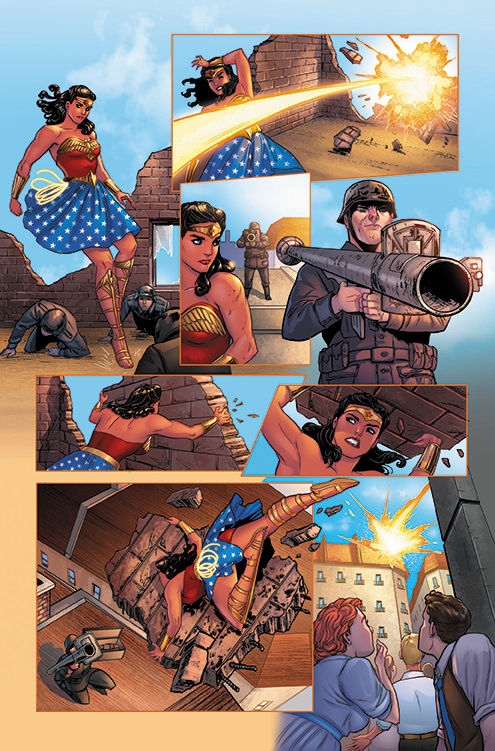 While Wonder Woman is providing assistance to the Allied forces in Europe and giving citizens a beacon of hope, her enemies are taking note of her as well. From the Axis powers to Ares himself, Diana's enemies find her existence disruptive to their plans and work to stop the heroine once and for all. As the mediator for both Ares and the Axis powers, the Duke of Deception decides to take matters into his own hands and take out the Wonder Woman himself. Arranging a meeting with Wonder Woman in Athens, the Duke of Deception takes on Diana in a fight to the death. Before the Duke of Deception can kill her off, however, the soul of Alcippe and the Greek gods themselves intercept to inform Diana of what's really happening and make her an offer. The Greek god Zeus informs Diana of the history of Themyscira, the Baelytus, and the role that Ares has played in all of the conflicts she's experienced since her childhood on Themyscira. He tells Diana that the Baelytus is the heart of an ancient Titan that sought to destroy the world billions of years ago and was successfully sealed away upon defeat. The Greek gods then created Themyscira to seal both themselves and the Baelytus within it. Zeus selected Queen Hippolyta as the protector of the Baelytus and only granted her immortality on the conditions that she remain obedient to him. In the thousands of years that Themyscria thrived, Ares plotted with Hades to remake the world in his image and originally selected his high priestess, Antiope, to carry out his plans. When she failed to do her task to Ares' satisfaction, that was when he recruited Thomas Byde to execute his plans as the Duke of Deception. His task? To collect as many souls of the dead as possible to power up the Baelytus in order to revive the Titan. This resulted in Queen Hippolyta losing the Baelytus as well as Themyscira. Zeus then makes an offer to Diana she can't refuse: if she swears obedience to Zeus and becomes his champion, he will bestow powers upon her to defeat Ares and the Duke of Deception. The catch? Zeus still wants the Titan to be revived to destroy the world as it exists so that he too can remake the world to his liking, effectively removing free will. Diana is given the choice, but ultimately refuses Zeus' offer. While she acknowledges that the world is corrupt and wars exist, she also acknowledges that there is still love and good in the world, and she strongly believes those things are worth saving. She also does not wish to pursue a life of servitude to a god she does not believe in like her mother did. This enrages Zeus to the point of stripping all of the powers from the gifts her mother, the Queen, gave to her and leaves her powerless. 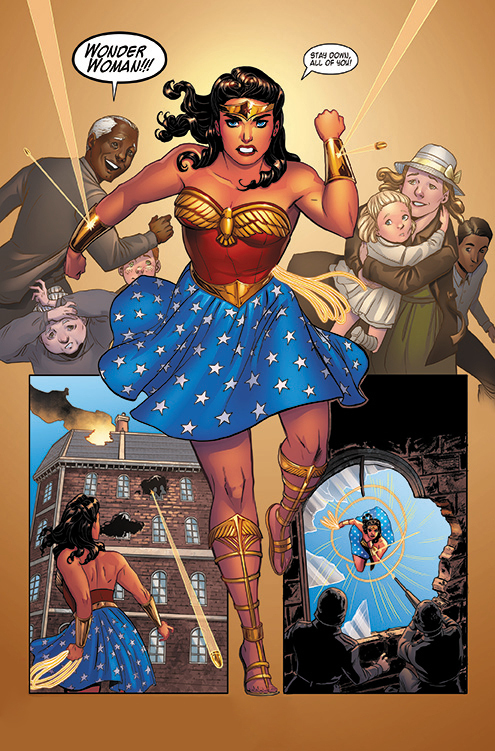 Unity is one of the themes explored in issue #7 of De Liz' miniseries, primarily in the form of Wonder Woman making her public debut and allying herself with various allied countries in the war efforts. All around Europe, she is seen liberating various civilians from hostiles in a time of war, and even inspires bravery in both soldiers and civilians alike. Despite the atrocities that are being committed around the world, people still feel like they have a champion on their side, which provides them with a sense of protection and a reason not to give up hope. While it's very easy for modern writers to depict the more cynical side of a narrative such as this, I love that De Liz does something different and actually brings us back to the reason we look up to superheroes in the first place. We already live in a world that's full of injustice and a mass media that already does a fine job at reminding us how rotten the world is, sometimes to the point of leaving you feeling depressed and angry. It's no wonder superhero comics were at peak popularity during World War II and why soldiers often read these stories while serving overseas. That was true back in 1944 (when this comic is set) and that's unfortunately still true in the year 2016 where superhero comics are now building entire film franchises. One major difference, however, is that most media have gotten more cynical in their storytelling in this century that it makes a comic like Legend of Wonder Woman stand out as a truly inspirational piece of work. 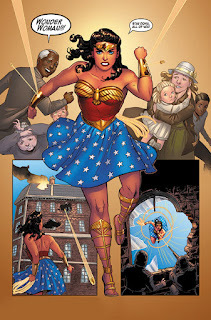 The narrative that Legend of Wonder Woman provides brings the superhero comic back to its roots as a medium that acknowledges real world injustices but also depicts us triumphing over those injustices, not succumbing to darkness and ultimately losing that war. De Liz' Wonder Woman embodies that very idea. The character of Diana Prince in Renae De Liz' story is not a dark and brooding hero who has lost faith in humanity the moment she saw the kind of damage human beings are capable doing. It doesn't anger her, instead it motivates her to make a difference in the world. She has strong compassion for all living things and sees good in people. She doesn't subscribe to the idea that people are inherently good or evil, she's well aware of the fact that evil is made. Instead of going after her enemies with the goal of punishing them for their evil deeds, she instead seeks to attack the root of the problem. She looks for that moment in a person's life that led that individual to make a real wrong turn in their life and pull them back from that. That theme is particularly explored in her encounter with the Duke of Deception, whom she knows is just an ordinary man suffering from tremendous loss. The Diana Prince that we get in De Liz' story is a woman who smiles and enjoys the world she is a part of and the company of the people she meets. She doesn't let the more rotten aspects of the world break her belief in the goodness of people, and instead she allows the good that she finds in the world to drive her desire to protect it. She doesn't allow anyone to tell her it can't be done and always seeks to find a way to avoid casualties. De Liz' Diana lives up to the name of Wonder Woman by embodying the best of humanity and by setting the best example as a way of creating unity amongst people. Another major theme that is explored in this issue is the theme of choice. One major plot point that has been explored very thoroughly since issue #1 is the subjugation of humanity to a higher authority. On Themyscira, that took the form of the Greek gods promising a life of prosperity on the island, provided that its inhabitants--and especially its queen, Diana's mother--lived in servitude to them. This was something Diana has taken issue with since childhood because it meant--from her point of view--that the people of Themyscira weren't really living their lives freely. She especially questioned why her mother chose a life of obedience to a pantheon of gods in exchange for her actual freedom. One of my favourite moments in this issue came in the scene where Diana got to confront the Greek god Zeus for the first time in her life. It was a very powerful scene precisely because Zeus tried to subjugate Diana in the same way that he did her mother all those centuries ago in exchange for more power and she actually turned him down. She actually said 'NO' to him, which he considered an act of defiance against him. Though Diana knew she was going to lose her powers in rejecting Zeus' offer, at the same time, Diana found it liberating because it now meant that she could fight the world's battles on her own terms, using her own strength, and her own tactics. In a way, Diana rejecting an allegiance to Zeus symbolised a rejection of patriarchy because she ultimately rejected living her life on male terms. She was not going to allow a male god to decide what the rules were going to be and she was especially not going to allow the destruction of a world that still has love and good in it so that he can remake it in his own image. She was not going to exchange an already unequal world that still has room for improvement for another world of inequality where people once again have no power against some very temperamental and frankly oppressive gods. Diana decided that she was going to live her life on her own terms and work to make the world a better place on her own terms. She has enough faith in humanity to believe that if she continues presenting a better example, she can achieve something far greater than just merely being an icon of justice: she can inspire people to become better human beings and together create a better world, which is the ultimate feminist message. The last major theme that is explored in this issue is love. This issue doesn't just celebrate one form of love, but all forms of love. One aspect of love that is celebrated in this issue is the love that exists between friends as best depicted between Diana and Etta Candy, who in this issue make a direct reference to Wonder Woman #1 (1942), when De Liz and husband Ray Dillon recreated the iconic 'Woo-Woo! Ride em' cowgirl!' scene from that issue. Another aspect of love that is beautifully depicted in this issue is the love between sisters as best symbolised by the Holliday Girls who came to back up Etta, who is the lead singer of their music group. The last aspect of love that is depicted in this issue is the romantic love that Steve Trevor has for Diana Prince, whom he doesn't know yet is Wonder Woman. What is great about how De Liz presents each of these examples of love is that neither one overshadows the other and presents them all as important. When it comes to writing Steve's romantic interest in Diana, De Liz doesn't present him as a guy who feels like he has to prove his masculinity to her, but at the same time he is well aware of how he is expected to behave as a man, and wonders if this will be a problem to the woman he likes. I like that De Liz presents this often underrepresented point of view in her story because too often we get narratives that reinforce rigid gender roles by creating male heroes who embody toxic masculinity. It often robs these male characters of their humanity by turning them into power fantasies who possess more 'god-like' qualities than any real human ones. It's good for men (and boys) to see themselves represented as people who experience a wider range of thoughts and emotions and not just the few that patriarchal society celebrate as 'appropriate' for men. It's good for men to see themselves validated as human beings and not as power fantasies that embody a very narrow view of what means to be a person. 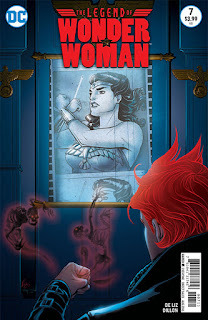 On the whole, Legend of Wonder Woman continues to be a rare gem of a superhero comic in an era of comics storytelling that's too preoccupied with making drama too literal and excessively violent as a way of making the reader care about what happens in the story. I like that De Liz is more nuanced in her writing and that she depicts conflict in a wide variety of ways. Conflict isn't just literal in her story but metaphorical as well. She doesn't resort to brutality and excessive use of violence to get the point across that bad things are happening to people, she instead uses gloomy imagery to convey the idea of death and destruction. Despite fighting within the context of one of the most devastating wars in history, De Liz keeps Diana's conflicts personal, but also counterbalances those conflicts with positive experiences Diana has in the world. It's definitely a Wonder Woman story for the ages and one that acknowledges that superhero stories are meant to inspire, not perpetuate the same inequalities we already experience in the world.